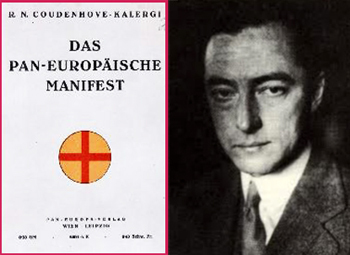 In 1923, Count Kalergi (Richard von Coudenhove-Kalergi) published a document titled Pan-Europa Manifesto calling on the nations of Europe to join together and form a federated union. This federation should rise above nationalisms, unite the economic and political interests of the many countries of Europe, create a common defense against external threats and turn the national war industries away from weaponry and towards a pacific enrichment of all European men. This utopist supra-national conglomeration of States should simply be called “Europa;” with this manifesto Count Kalergi sowed the seeds that would culminate in the creation of the today’s pan-European supra-national entity: the European Union. The European Union (EU) as it stands today is one of the most important political-economic entities in the world. If considered as a single political entity, it contends with the likes of United States, Russia and China for position as a world power. EU legislation influences the lives of hundreds of millions of Europeans (over 740 million as of this publication), while its trade policies have repercussions world over. From a cultural standpoint, the European Union is also important because it is an entity that presides over the once Christian nations of Europe. Within its borders the European Union houses the world’s most magnificent cathedrals and castles. The spirit, energy and ethos of Europe exist nowadays under the EU flag. Since the EU is an important player in the world today, this series of articles is intended as a primer to assist in understanding the history, import and context of the European Union as well as the part that such a supra-national organization plays in the grand scheme of History, Christianity and the Revolution. Though Kalergi declared his pan-European ideals as early as the 1920s it was not until the devastation following World War II that the heads of Western Europe began to consider union in earnest. Having witnessed the destruction wreaked by rampant nationalisms of Germany and Italy, the victorious allies began to seek a longstanding solution to prevent such a disaster from ever happening again. To this end they created the European Coal and Steel Community, an integration of industries between West Germany, France and several other western European States that would prevent any one nation from being able to produce its own weaponry. Building on this, the founding States would later sign the Treaty of Rome (1957), formally establishing a common and free market between members. With this treaty, people, goods and services could travel freely within the zones of the member States (then, primarily France, West Germany, Italy and the Netherlands). They called it the Western European Union, to contrast it with the communist Eastern Europe. Between 1989 and 1991 the Soviet Union collapsed and Communism changed its tactics. The West was elated at the apparent failure of the “evil empire.” The time seemed ripe to update the Western European Union and bring the ex-satellite countries of the USSR into the fold. 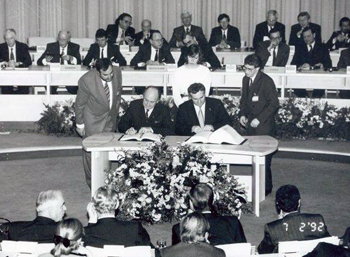 Thus, on February 7, 1992, the Treaty of Maastricht was signed, bringing the newly United Germany into the group and setting the stage for later expansions that would see the entrance of several other ex-satelittes or ex-soviet States. By 2004 the EU had come to resemble what we know today, with only a few more countries joining the union over the succeeding decade. Thus, the European Union has come to represent one of the largest political-economic entities in the world. Establish a common foreign and security policy. 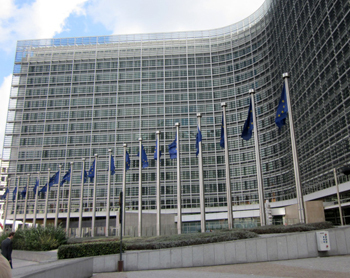 The European Union established its capital in Brussels. There the European Commission proposes legislation to the European Parliament, which then discusses and votes on the legislation. Members of the EU Parliament are elected by their home State. Policies decided upon by European Parliament are implemented by the Commission. The European Commission is, therefore, the head, inspirer and ruler of the EU. To achieve greater economic integration, the EU introduced the euro in 1999 as a common currency intended to replace national currencies. 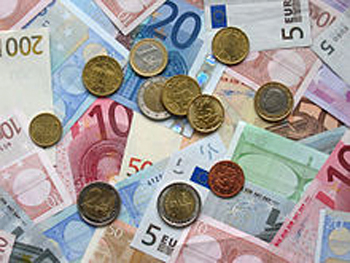 Today the euro is used by 19 of the 28 member States. Per Maastricht the European Union also seeks to establish a single market, that is to say, an economic zone where goods, people, services and capital can travel freely between member States and are subject to nearly identical regulations, as such free trade exists to varying degrees between members. To further establish European unity a free-travel area known as the “Schengen zone” has been established that permits passport free travel between member States. Once within Schengen a person can cross borders between participating States, for example going from Belgium to France, without so much as a border check. This policy is only recently being challenged in light of the recent terrorist attacks. Though Maastricht brought the European Union formally into existence, the integration and centralization of Western Europe had already been happening under the aegis of the Western European Union. The EU was simply the next step following the fall of the USSR. Essentially the EU merely comprises the European expression of a worldwide trend that already sees States and nations increasingly integrating. Though these ideals have been present for some time, it was only following World War II that globalism began to be implemented on large scale. This movement tends to a global union of States under one supranational government. It is this anti-natural end, this perverse federalism of which the EU is a stepping stone to reach the goal of the Revolution. In the next article I shall address the errors of the European Union and its guiding philosophy.